Ginger may conjure images of fragrant gingersnaps, spiced apple pie, or other holiday desserts, but it has become a popular ingredient in the wellness world for its potential health benefits. Ginger is available in many forms, including powders, capsules, and as crystallized ginger. Crystallized ginger isn’t just a delicious treat — it’s also a great way to experience the potential health benefits of ginger for yourself. Ginger has been used in cooking and to support health for thousands of years. The ginger plant, or zingiber officinalis, was originally cultivated in Southeast Asia and is a member of the same family as turmeric and cardamom. It is also widely grown in tropical regions of Africa like Sierra Leone and Nigeria, Latin America, Australia, and the Caribbean (particularly in Jamaica). Ginger has a long history of use in Asian cultures, where it was used as a cooking spice and to support health. Ginger was first introduced to the Western Hemisphere in the first century AD, primarily via the spice trade that operated from Asia to Europe. Ginger was popular in the Roman Empire, both as a seasoning and as a health-supportive supplement, but it largely disappeared from common use in Western culture after the fall of the Roman Empire. Ginger use resurfaced in the middle ages, particularly in England. During this time it was highly valued, and it is thought that in the 13th and 14th centuries a pound of ginger was equal to the price of a live sheep. As the ginger trade expanded, so did cultivation. Arab nations brought the crop to Africa, and it also spread to the western hemisphere. In 11th century Europe, ginger was added to drinks, made into pastes, and added to cooking meats. In the 15th century, ginger was the defining flavor of a new dessert supposedly invented by Queen Elizabeth I: the gingerbread man.Today, India is the largest producer of ginger, cultivating about 655,000 tons annually, followed by China, Nepal, Indonesia, and Thailand. Today, ginger is ubiquitous in grocery stores and natural health stores. It is still used in a number of practices to support health, such as Ayurveda and Traditional Chinese Medicine. Ayurvedic texts recommend ginger for joint health and to soothe the stomach, and it is also thought to support a healthy digestive system. It is thought to be particularly helpful for balancing the Vata dosha, since Vata types are associated with air, wind, and coolness and ginger is considered a warming spice. It is also believed to support circulatory system health. In Traditional Chinese Medicine, ginger is thought to spread warmth, so it’s often used to support digestive system health. The text Be Cao Jin Ji Zhu recommends ginger, as it may be potentially beneficial in “helping digestion, to strengthen the spleen and stop vomiting and nausea, also warm the stomach and to stop the stomach spasming from the coldness.” It is also thought to support your Qi and yang energy. Ginger plants grow to roughly 1.2m and the shoots (called pseudostems) are formed from overlapping leaf bases wrapped around each other, which branch off to form mid-green leaf blades. It produces flowering heads with short, cone-shaped spikes and pale yellow flowers with purplish edges. These plants are sometimes used in landscaping in subtropical areas. However, most plants are cultivated without the flowering stems, since the most popular part of the ginger plant is the root, or rhizome. Why Take a Ginger Supplement? Ginger supplements are some of the most popular herbal supplements today. Ginger is taken for a variety of reasons, including to support muscle and joint health, and for temporary relief of stomach issues associated with travel and pregnancy. Ginger also contains ingredients that may support healthy saliva production and promote digestive system health. Ginger is most commonly found in capsules, powders, and teas, although there are other options available as well. One of the most common uses for ginger is as a way to soothe the stomach, especially during situations like travel-related sickness. There is evidence to suggest that ginger may have positive effects on nausea and vomiting. It is thought that ginger may inhibit the transmission of certain nerve impulses that may cause spasms of smooth muscles and result in an upset stomach. As a result, ginger is often taken as a natural alternative to offer temporary relief from nausea. Ginger is also used to offer support for muscle and joint pain. In a study conducted by the University of Miami, participants with moderate-to-severe osteoarthritis were offered a twice-daily ginger supplement. According to researchers, “A highly purified and standardized ginger extract had a statistically significant effect on reducing symptoms of OA of the knee. This effect was moderate.”  While studies into ginger’s effect on joint health are ongoing, it seems as though ginger may have potential benefits in this area. What makes ginger so unique isn’t just its use in cultures to support health, it is also a common spice used to flavor foods and beverages around the world. From calming cups of ginger tea to spicy ginger candies, nearly every culture uses the spice in their cuisines. For example, in Ayurveda, ginger is a common ingredient in masala chai and can also be found in some curries. In Japan, ginger is often pickled (in fact, you may have seen this kind of ginger when you order sushi) or found in candies, and it’s also an ingredient in Korean kimchi. China also has a long history of ginger use, and it is often brewed into tea or used to season meats. Ginger also forms a part of recipes in Burma, Thailand, Indonesia, Malaysia, the Philippines, and Vietnam, where it is added to drinks, soups, salads, and more. In the US and Europe, ginger is found in holiday desserts like gingerbread, gingersnaps, and pumpkin pie. Of course, crystallized ginger is one of the most popular ways to consume ginger, and it’s easy to even easy to make on your own. A combination of sweet and spicy, crystallized ginger makes a great addition to dishes, or can be consumed as a treat. Having crystallized ginger is also a great way to get the ginger you need if you don’t want to take a more traditional supplement. If you’re interested in making your own crystallized ginger, it can be easily accomplished. Make sure to choose a younger ginger rhizome that is firmer and not spongy, as this will be easier when you are crystallizing. When slicing your ginger, you can slice it however you wish, although some popular options are strips, coins, or cubes. Combine water and 1 ½ cup sugar in a small saucepan and bring to a boil. Using a slotted spoon, transfer the ginger to a wire rack. It’s a good idea to set the rack over a dish or pan so your countertops don’t get sticky. Let stand until dry, and then roll the ginger pieces in the excess sugar. You can store your ginger in an airtight container for up to three months. Besides being a great-tasting snack, crystallized ginger makes a great addition to recipes. You can serve it as a salad garnish (it’s especially good on Asian-inspired salads), or add it to a stir-fry. You can also chop crystallized ginger and add it to your favorite cookie, bread, or cake recipe. It also makes a great-tasting topping for apple pies, and can be dipped in chocolate for a sweet and savory treat. Other ways of serving crystallized ginger include adding it to cranberry sauce, adding it as an ingredient to rice or meat dishes, and melting it to create a spicy glaze. You can also make a simple ginger tea by steeping crystallized ginger for a few minutes in a cup of hot water. You won’t even need to add sugar to this spicy herbal tea, as the sugar from the crystallized ginger will automatically dissolve. 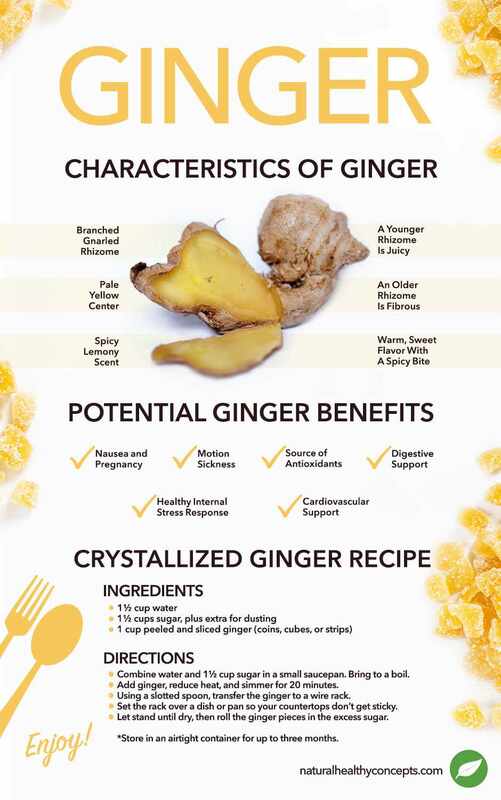 If you’re looking to experience the potential health benefits of crystallized ginger for yourself, you can purchase it here at Natural Healthy Concepts, or try your hand at making your own. Whatever you choose, learning more about the potential health benefits of ginger may convince you to add this spicy plant to your diet.